Search has become so ubiquitous and an important aspect of how we access information on a daily basis. To illustrate, looking at Google stats alone, on average there are 40,000 searches a second, 3.5 billion searches per day, and 1.2 trillion searches a year. These numbers are absolutely staggering and show the density and stickiness of search. But why has search grown so tremendously? Search engines are free, easily accessible, and ultimately extremely useful tools that allow us to find relevant and useful information to most queries we have within seconds. Not only is search a really useful and great tool for the average Internet user, it has become an invaluable tool for businesses, working professionals, entrepreneurs, startups, and more because of the ability to get in front of more of their potential customers or decision makers. Search is one of the unique channels in that it offers the ability for businesses to reach customers when they are actively searching for something related to a businesses’ product or service. No other marketing channel allows this ability. What this means for your business, website, blog, etc. is that you can now reach people who are interested AND actively searching for your product, service, etc. So, search engines are amazing and there’s this great opportunity to reach more people who are interested in my product, service, etc., now what? You have to learn how to utilize this tool to create impact for your business and deliver results. Well, where could I learn that? 😉 A quick search could get you on your way, or you could keep reading and learn 11 basic things you could do to improve your website’s search presence. Enter SEO, Search Engine Optimization, which is the process of optimizing your website to be more easily crawlable by spiders of the Internet. No really. The internet has spiders too, except their main job is to crawl most of the Internet’s links and roll that up into a huge corpus of data which is then analyzed algorithmically to determine relevance based on many different factors. A more appropriate and understandable definition of SEO is that it is a marketing discipline focused on growing visibility in organic (non-paid) search engine results. Search engines are complex and sophisticated yet they are many areas where they need your help in understanding your website better. The following list is meant to serve as a very basic SEO checklist to make sure the other SEO strategies you employ are effective. Google Analytics is a free tool that allows you to gain insight into your visitor demographics, where your website traffic is coming from, and a lot more. 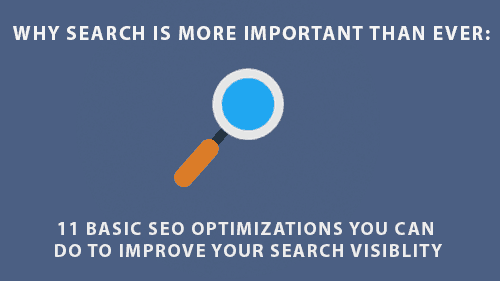 It’s a powerful tool that is going to allow you to measure your search engine optimization efforts. Google Search and Bing Webmaster Tools allow you to analyze many factors that affect your search traffic. For me, it’s a definite must-have. Google PageSpeed Insights gives you insights into the speed of your website, and whether it is optimized properly. The bare minimum score you should aim for is 80/100. Anything over 85/100 is considered good for both mobile and desktop. The longer that it takes your website to load, the more likely your visitor is to move on. For the non-technical. Use a plugin for your CMS (Content Management System) to be able to write your own title, meta description, image tags, h-tags (headers), and page tags. All of these attributes are important for an SEO strategy. Images, text, and layout should be optimized for a great user experience across all devices. Don’t make the spiders angry! This won’t really happen but broken links are bad for users and search engines alike. Make sure all your links, buttons, etc. work and go to the right spot. Use a free tool like AtomSeo to identify all of your website’s broken links easily. Using outdated HTML and CSS could plummet your search engine efforts. Use tools from the W3C (World Wide Web Consortium) such as HTML validator, CSS validator, and mobile code validator. A site map is a model of a website’s content designed to help search engines navigate and crawl your website. Use a dynamic sitemap.xml generator like XML-Sitemaps (free for up to 500 pages) to generate a sitemap for your website. Follow the instructions regarding uploading your sitemap to the domain root of your website. Next, submit the sitemap link (yoursite.com/sitemap.xml) to Google Search Console and Bing Webmaster Tools (from #2). A robots.txt file instructs search engines about which pages to crawl, and which pages to leave alone. Want more information about robots.txt? Learn more from Google’s support page about robots.txt. Note: In a robots.txt file, certain pages are given higher priority than others, such as your homepage, which you would likely want to be your main ranked page for your website’s keywords and content. Setup your website with an SSL certificate that gets you an HTTPs (Hyper Text Transfer Protocol Secure) that encrypts your buyers’ inputs, and builds trust with search engines and users at little to no cost. If you found this helpful, let me know. I’ll be following up this blog post with a series of blog posts more about SEO and the different aspects (on-page, off-page, and content optimization).